With the Samsung Galaxy SIII becoming all sorts of official yesterday on Verizon, we thought we would take its specs and compare them to the other major players from Big Red that are currently available. We know that many of you have a big decision to make in the next couple of weeks as contracts come to a close and upgrades free up, so maybe this will help. 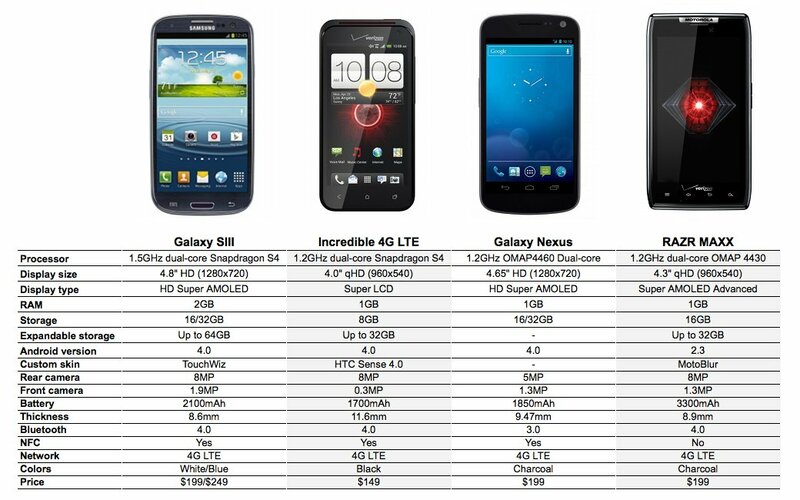 In this chart, you will see the GS3 up against the Incredible 4G LTE, Galaxy Nexus, and DROID RAZR MAXX as those (to us anyway) are the cream of the crop right now. Galaxy Nexus LTE 4.0.4 IMM76K System Images Posted, Go Get 'em!